A classic pumpkin pie recipe - smooth, creamy and just moderately spiced. 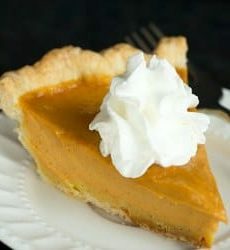 The best pumpkin pie you'll ever eat! Make the Pie Crust: Process ¾ cup flour, sugar and salt in a food processor until combined, about two 1-second pulses. Add the butter and shortening and process until homogenous dough just starts to collect in uneven clumps, about 10 seconds; dough will resemble cottage cheese, but there should be no uncoated flour. Scrape the bowl with a rubber spatula and redistribute dough evenly around the blade. Add the remaining ½ cup flour and pulse until the mixture is evenly distributed around the bowl and the mass of dough has been broken up, 4 to 6 quick pulses. Turn the mixture into a medium bowl. Sprinkle the vodka and ice water over the mixture. With a rubber spatula, use a folding motion to mix, pressing down on the dough until the dough is slightly tacky and sticks together. Flatten the dough into a 4-inch disk. Wrap in plastic wrap and refrigerate for at least 45 minutes or up to 2 days. Adjust an oven rack to the lowest position, place a rimmed baking sheet on the rack and preheat oven to 400 degrees F. Remove the dough from the refrigerator and roll it out on a generously floured work surface to a 12-inch circle. Roll the dough loosely around the rolling pin and unroll into pie plate, leaving at least 1-inch overhang on each side. Ease the dough into the plate by gently lifting the edge of dough with one hand while pressing into plate bottom with other hand. Refrigerate for 15 minutes. Prepare the Pie Filling: While the pie shell is baking, whisk cream, milk, eggs, yolks and vanilla together in a medium bowl. Combine the pumpkin, yams, sugar, maple syrup, ginger, cinnamon, nutmeg and salt in a large heavy-bottomed saucepan; bring to a sputtering simmer over medium heat, 5 to 7 minutes. Continue to simmer pumpkin mixture, stirring constantly and mashing yams against sides of pot, until thick and shiny, 10 t0 15 minutes. Bake the Pie: Return the pie plate with baking sheet to oven and bake pie for 10 minutes. Reduce oven temperature to 300 degrees F and continue baking until edges of pie are set and the center looks firm but jiggles slightly (an instant-read thermometer inserted in the center should register 175 degrees F), 20 to 35 minutes longer. Transfer pie to wire rack and cool to room temperature, 2 to 3 hours. Serve with whipped cream. Leftovers should be stored in the refrigerator for up to 3 days.